A young woman during a Sunrise Ceremonial celebration. When an Apache girl reaches puberty, she and her family take part in a Sunrise Ceremonial celebration. Family members, community members, and Apache leaders help carry out this cultural ceremony. In order to ensure that all rituals are performed properly, preparations begin months in advance. On the day before the Sunrise Ceremonial, the girl takes a sweat bath while the medicine man and her male relatives create the ritual items necessary for the ceremony. Later that evening, the men present her with these items. The actual ceremony consists of eight stages that take place over a four-day period. 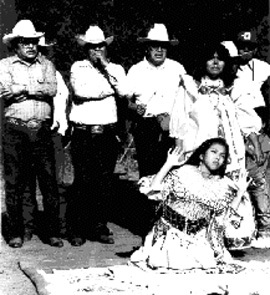 Throughout the four days, the girl dances for many hours in Apache clothing to demonstrate her womanly strength. Relatives and friends sing dozens of traditional songs and special dancers accompany her at appropriate times. She also receives a massage and later a ritual blessing from the medicine man and other adults. The Apache, just one of many Native American tribes, seeks to maintain their culture and traditions despite westernization. For this reason, many families continue to practice the Sunrise Ceremonial to usher their daughters into womanhood.